Euro continues growing up, and I’ve decided to move the stop on my yesterday’s buy order into the black. The first target for the bull is still at the level of 50% (expansion) with several more confirming levels near it. If the price breaks them, the pair will continue moving upwards. The first temporary target at the H1 chart may be reached on Friday. Later, in the beginning of the next week, after a slight correction, the pair may reach the second target. Franc is being corrected, and I’ve decided to open a short-term sell order. There is a possibility that the pair may break the latest minimum until the market closes before the weekend. The main target is still at the level of 61.8% (expansion); the bears may reach it next week. 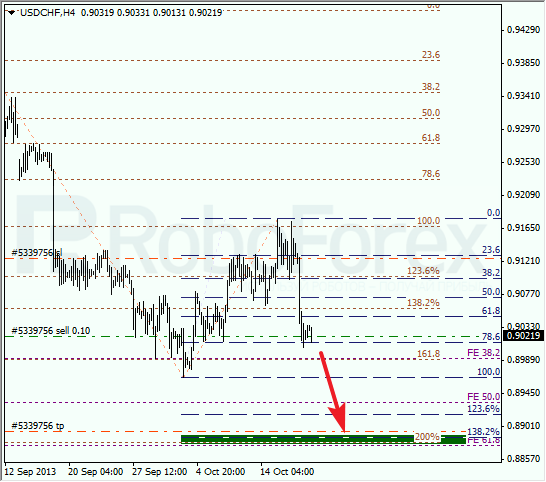 At the H1 chart we can see, that the price is consolidating inside one of the temporary fibo-zones. The next target may be reached on Monday. If the pair continues falling down during the day, I’ll move the stop into the black to avoid any risk during the weekend.